Dinosaur and Paleontology stories were always among my favorites to work with at National Geographic. 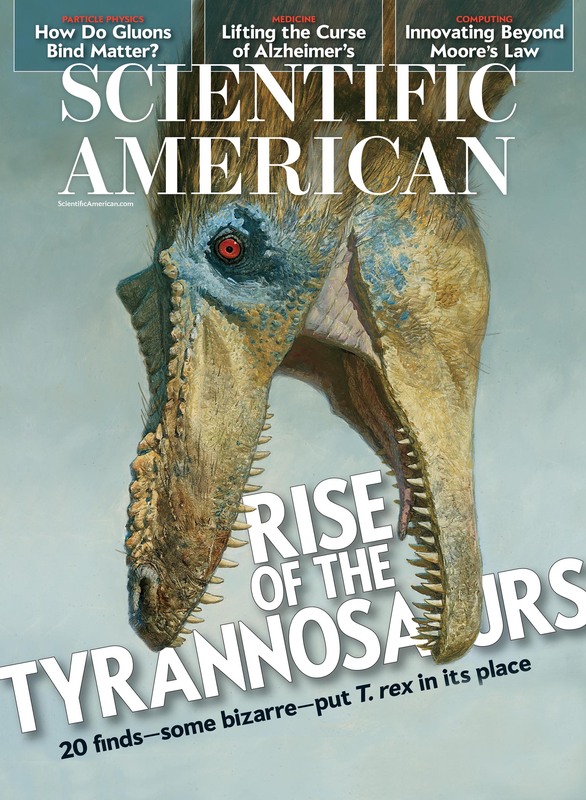 Recently I had a chance to work with Scientific American Magazine on a fun and fascinating story on the rise of Tyrannosaurs. The story, by prominent paleontologist Stephen Brusatte, is on the May ’15 issue. New discoveries are showing us that tyrannosaurs were a surprisingly diverse bunch that slowly evolved into the gigantic proportions of the iconic Tyrannosaurus Rex. Jen Christiansen, the Art Director of information graphics, asked us to create a spread infographic for the story. 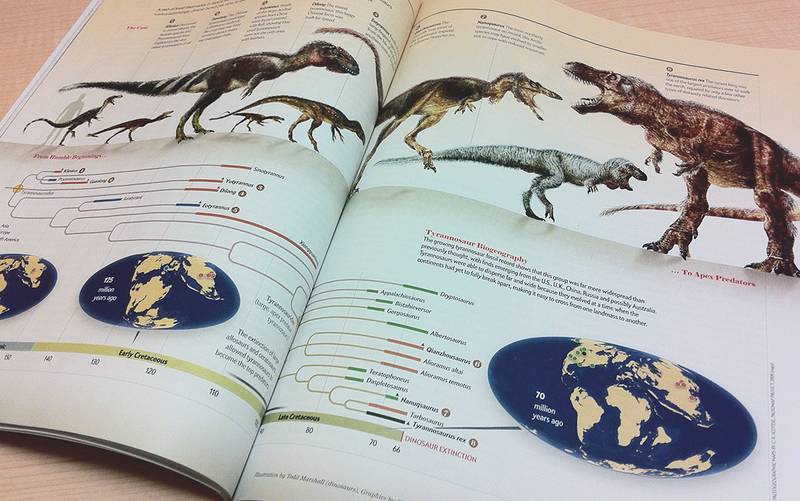 We showed the tyrannosaur family tree with amazing illustrations by Todd Marshall. The maps reveal how tyrannosaurs evolved at a time when the continents had yet to fully break apart, so their fossils are now found in very different parts of the world. The story has a gorgeous cover by James Gurney, the master illustrator you may know from his famous Dinotopia series. We art directed him (which amounts to little since he doesn’t really need much direction!) in a spread illustration for the story. We’ll show you the sketch to final process and a great make-of video by Gurney in a few weeks, in the meantime we don’t want to spoil the issue for you, run to your newsstand or order it online! By the way Jen Christiansen keeps a really nice blog, SA Visual, with articles on the graphics process at Scientific American and on other graphics-related topics. Highly recommended. This entry was posted in Graphics by 5wgraphicsblog. Bookmark the permalink.